Upgrade to a Superior Package (4 star accommodation) is available, please enquire. Discover the very best of Switzerland on this eight day tour through spectacular mountains and past sparkling blue lakes. Enjoy an excursion to Stanserhorn and experience the world’s first open top cable car. Jump aboard the Golden Pass train and travel over the Brünig Pass to Interlaken, passing blue lakes, green meadows and age-old chalets along the way. 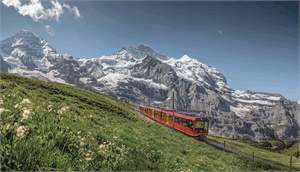 Take the Jungfrau railway to Jungfraujoch, the highest railway station in Europe at 3,454 metres. At the summit enjoy views of the breathtaking Aletsch glacier, visit the Ice Palace, partake in some sledding or admire the views from the Sphinx Observation Terrace. Travel on the ‘Chocolate Train’ and visit one of the famous cheese factories in the Gruyères area, as well as the Cailler chocolate factory where you can enjoy a chocolate tasting session. Glacier 3000 is a mountaintop that allows you to enjoy spectacular view of the Bernese Alps and grab something to eat at the Resturant Refuge L'Espace (cost applies for meals/refreshments). Travel along the Golden Pass Line from Lucerne to Montreux. Enjoy views of the rolling countryside and meadows dotted with traditional chalets along the way. Look out for the first glimpse of Lake Geneva as the train winds through the vineyards to Montreux. Ride the slowest express train in the world, the Glacier Express. Cross 291 bridges, pass through 91 tunnels and marvel at the spectacular alpine scenery as you travel from Zermatt to St. Moritz. See the bizarre geological formations as the train weaves through the Rhine Gorge and over the dramatic Oberlap Pass. 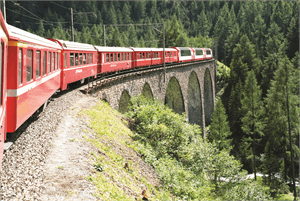 Board the Bernina Express in St. Moritz and travel along circular viaducts and over remote glaciers before heading down to the border. 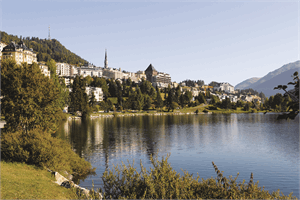 Change to the Bernina Express bus and travel through Italy to Lugano along the lakes. From Lugano wind from the Mediterranean south to the traditional heart of Switzerland on the Gotthard Panorama Express. Take in the fresh mountain air as you cross Lake Lucerne by boat. Enjoy mountain excursions to Jungfraujoch, the 'top of Europe', and Gornergrat for a glorious view of the Matterhorn. PACKAGE TERMS & CONDITIONS: It is our policy to present the cost of our holidays inclusive of all airport and government charges. Please accept however that these charges are not within our control, therefore we reserve the right to pass on any increase.. Travel agent professional service fees where charged, will be additional to the advertised prices. Closeout and blackout periods apply over school holidays and peak holiday periods & availability of seats & rooms is likely to be very limited over this time . Valid for sales to 15 Jun 2019. Valid for travel commenced and completed within the period 1 Apr 2019 to 30 Jun 2019 (unless otherwise specified).A non-refundable deposit per person is required at the time of booking. Discount is per person based on 2 people sharing the room (twin share) and is already included in the price. Valid for new bookings only. Not valid for group travel. Offer is subject to availability and blackout dates may apply. Offer may be withdrawn at any time. Other conditions may apply. Events beyond our control such as currency fluctuations may result in price variations. Prices shown are based on per person costs in New Zealand Dollars, for payment by cash, cheque or eftpos only. Credit card sales not permitted unless Travel Agent acts as a merchant. Capacity limitations apply and may not be available on all services. Strict cancellation fees apply. For full terms and conditions and cancellation fees please contact your local travel agent for more information. Trade enquiries via GO Holidays. Tours operated by Swiss Travel Centre.